Synthetic peptide conjugated to KLH derived from within residues 650 to the C-terminus of Mouse TBR2/ Eomes. WB: Human ES Cells treated with Retinoic Acid (24h) Whole Cell Lysate, Mouse Embryonic Brain (E14) Tissue Lysate; Human Mesendoderm (Day 2) Whole Cell Lysate; EL4 cells + vector expressing V5 tagged Eomesodermin. 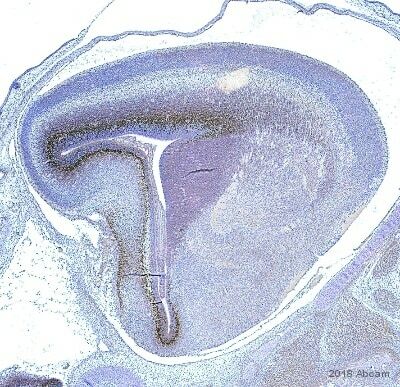 IHC-Fr: Mouse Embryonic Brain (E14.5); Adult C57/BL6 mouse forebrain coronal sections; Mouse developing cerebral cortex tissue; Mouse embryonic brain tissue. ICC/IF: Human embryonic stem cells differentiated into mesendoderm. IHC-P: Rat brain (e16) tissue. Tbr2 expression is observed in neuron progenitor compartments in development (the subventricular zone and ventricular zone) and expression rises and falls with cortical plate neurogenesis. Transition from radial glia to intermediate progenitor cell is associated with upregulation of Tbr2. Our Abpromise guarantee covers the use of ab23345 in the following tested applications. Abcam recommends the following antigen retrieval method: Heated citrate solution (10mM citrate pH 6.0 + 0.05% Tween-20). We recommend using Goat Anti-Rabbit IgG H&L (Alexa Fluor® 488) (ab150077) secondary antibody. WB Use a concentration of 0.4 - 2.5 µg/ml. Detects a band of approximately 85 kDa (predicted molecular weight: 72 kDa). IHC-FoFr Use a concentration of 1 - 2 µg/ml. Functions as a transcriptional activator playing a crucial role during development. Functions in trophoblast differentiation and later in gastrulation, regulating both mesoderm delamination and endoderm specification. Plays a role in brain development being required for the specification and the proliferation of the intermediate progenitor cells and their progeny in the cerebral cortex. Also involved in the differentiation of CD8+ T-cells during immune response regulating the expression of lytic effector genes. Note=A translocation t(3;10)(p24;q23) located 215 kb 3' to the EOMES gene but leading to loss of its expression was identified in a large consanguineous family. Homozygous silencing produces microcephaly associated with corpus callosum agenesis, bilateral polymicrogyria, ventricular dilatation and a small cerebellum. Contains 1 T-box DNA-binding domain. Detected at 7 weeks of development in the forebrain floorplate of the CNS. Expressed within the mantle layer and migrating neuroblasts of the telencephalon at 12.5 weeks of development. Additional bands at: 50 kDa, 65 kDa, 75 kDa. We are unsure as to the identity of these extra bands. This blot was produced using a 4-12% Bis-tris gel under the MOPS buffer system. The gel was run at 200V for 50 minutes before being transferred onto a Nitrocellulose membrane at 30V for 70 minutes. The membrane was then blocked for an hour using 3% Milk before being incubated with ab23345 overnight at 4°C. Antibody binding was detected using an anti-rabbit antibody conjugated to HRP, and visualised using ECL development solution ab133406. 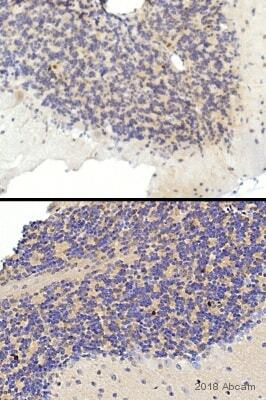 Immunohistochemistry (Frozen sections) - Anti-TBR2 / Eomes antibody - ChIP Grade (ab23345)Image from Azim K et al., PLoS One. 2012;7(11):e49087. Fig 5.; doi: 10.1371/journal.pone.0049087. Dlx2 and Tbr2 identify non overlapping progenitor lineages in the adult mouse SVZ (subventricular zone). (A–B) Adult C57/BL6 mouse forebrain coronal sections at rostro-caudal point 1.2 relative to the bregma were immunostained for Dcx (red), Dlx2 or Tbr2 (green) and Ki67 (blue). Both progenitor populations show characteristics of migrating neuroblasts, as indicated by their Dcx expression (C–D). Adult Mash1 mouse forebrain coronal sections at rostro-caudal point 1.2 relative to the bregma were immunostained for Tbr2 (red) and Dlx2 (blue). Both Tbr2 and Dlx2 exhibited EGFP expression, but showed no colocalisation. Right side captions show cropped individual channels and the merges. Full panel insets are zoomed and cropped DAB stained photomicrographs of rostral periventricular sections for Tbr2 in the dorsal SVZ (A), Dlx2 in the dorso-lateral SVZ (B) and Mash1 in the ventro-lateral SVZ (C). Yellow arrows and arrowheads show respectively positive stained cell and low level TF staining. Dotted lines mark approximate boundaries of ventricular space. Flattened confocal z-stacks are of 14–15 µm thickness, including captions. Scale bars: 15 µm in full panels, 20 µm in captions and 25 µm in insets. Antigen retrieval was carried out by microwaving sections in 0.01M sodium citrate (pH6.0) for 20 minutes. Sections were washed with PBS-0.01% Triton X-100 and then incubated for 30 minutes in blocking solution containing 20% goat or donkey serum, then incubated overnight at 4°C with ab23345 (1:100). 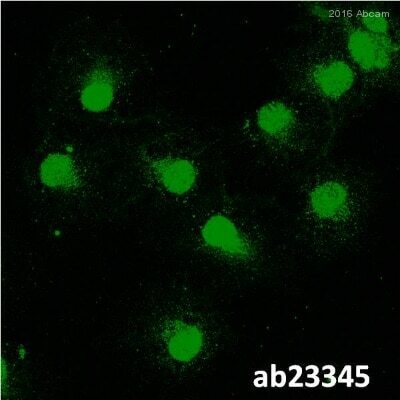 Following incubation with ab23345, sections were washed in PBS-0.01% Triton X-100 and incubated with the secondary antibody donkey anti-rabbit Alexa Fluor 568 for 1 hour at room temperature. Nuclei were counterstained with TOPRO-3 (1:1000). 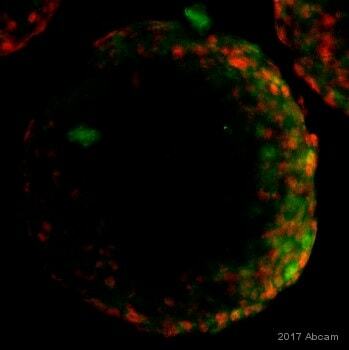 Fluorescent images were captured using a Leica NTS confocal microscope. 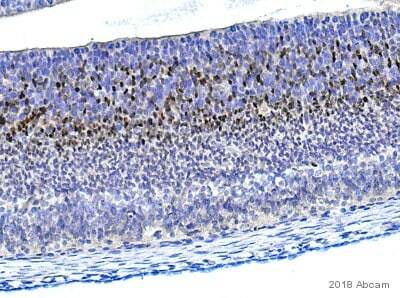 Immunohistochemistry (Formalin/PFA-fixed paraffin-embedded sections) - Anti-TBR2 / Eomes antibody - ChIP Grade (ab23345)This image is courtesy of an Abreview submitted by Mr. Carl Hobbs. Paraffin-embedded rat brain (e16) tissue stained for TBR2 / Eomes using ab23345 at 1/10000 dilution in immunohistochemical analysis, followed by anti Rabbit IgG Biotin. Human embryonic stem cells were differentiated into mesendoderm. Cells were then stained with DAPI (blue) and a TBR2 / Eomes specific antibody, ab23345 (1:100, red). Observed band size: 85 kDa why is the actual band size different from the predicted? IHC image of TRB2 staining in a mouse brain E14 frozen tissue section. The section was pre-treated using pressure cooker heat mediated antigen retrieval with sodium citrate buffer (pH6). Non-specific protein-protein interactions were then blocked in TBS containing 0.2% (v/v) Triton X-100 for 1h at room temperature. The section was then incubated overnight at +4°C in TBS containing 0.05% (v/v) Triton X-100 and 1% (w/v) BSA with ab23345 at 1/100 dilution. 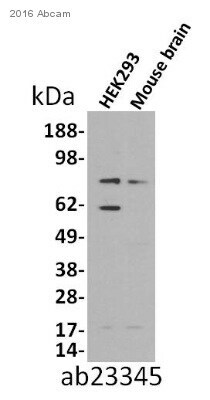 Goat Anti-Rabbit IgG H&L (Alexa Fluor® 488) (ab150077) secondary antibody was used to detect the primary antibody. The section was mounted with DPX. 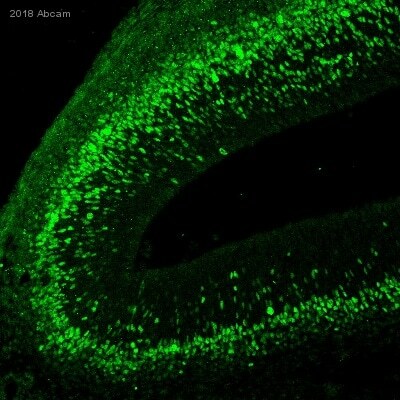 ab23345 staining mouse developing cerebral cortex tissue sections by IHC-Fr. Sections were PFA fixed and permeabilized in TX-100 prior to blocking with 2.5% serum for 1 hour at RT. The primary antibody was diluted 1/500 and incubated with the sample for 18 hours. 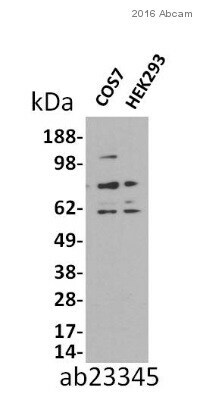 A biotinylated pig anti-rabbit IgG antibody, diluted 1/500, was used as the secondary. ab23345 staining TBR2 / Eomes in mouse embryonic brain tissue section by Immunohistochemistry (Frozen sections). Tissue samples were fixed with formaldehyde and blocking with 1% BSA and normal Goat serum for 30 minutes at RT. 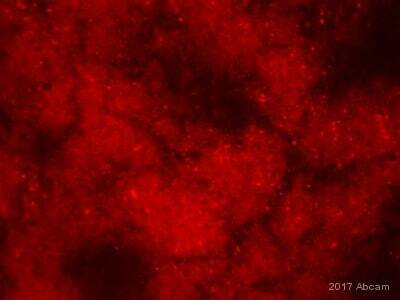 The sample was incubated with primary antibody (1/1000 in TBS + BSA 1%) for 10 hours at 40C. An Alexa Fluor® 555-conjugated Goat polyclonal to rabbit IgG was used as secondary antibody at 1/800 dilution. ab23345 detects a clear band of ~ 72 kDa in lysates from EL4 cells expressing V5 tagged Eomesodermin (lane 2). Lanes 1 and 3 contain lysates from EL4 cells expressing empty vector or V5 tag alone. Lanes 4-6 show the same lysates blotted with anti-V5 tag antibody. GAPDH was used as a loading control. Additional bands at: 74 kDa. We are unsure as to the identity of these extra bands.